Will you give us one night of your life? 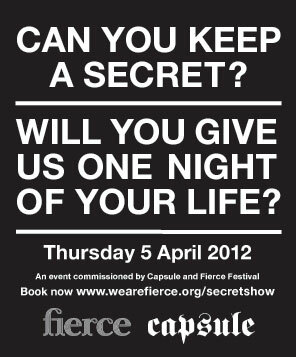 Capsule and Fierce Festival have co-commissioned a mysterious and memorable experience that will take place in Birmingham on Thursday 5 April as part of the next Fierce Festival (which runs from 29 March – 8 April 2012). The artists have insisted that their identity is kept strictly anonymous until after the event has taken place. Capsule and Fierce Festival are combining their expertise in producing cutting edge music, contemporary art and live experiences to create this very unique event. When you book you will be asked to leave an email address and phone number. We will arrange to meet you at a location near Birmingham City Centre, where your experience will begin. Please note you will be blindfolded as part of this experience.